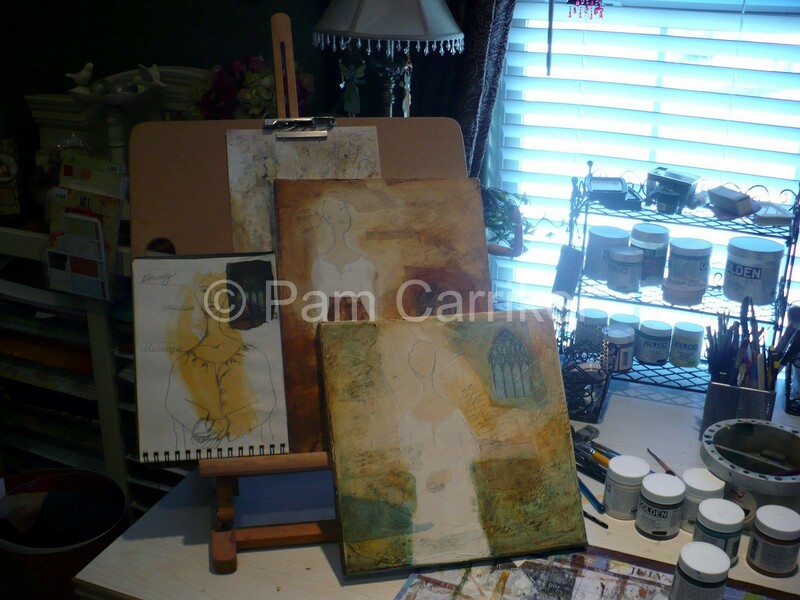 Yesterday, after being sick for four long days, I finally got back into my studio. It was so peaceful. After participating in Michelle Wards GPP Street Team Challenge, ‘Clean your plate’, my studio has again become my haven. I have reclaimed my space, and I enter it now with anticipation and joy. My muse visited me in my fevered state, and I made a couple of sketches in my art journal. With fall here, family talks have turned to ‘whose house will be hosting the Thanksgiving dinner?’ , and that is what inspired these two pieces, ‘Bounty’ and ‘Harvest’. Two words that hold an armful of meaning. You can see one of my journal pages with the sketch for ‘Bounty’. My husband played hand model for me while I played with how I wanted to show her hands. Try that one with a remote control clicker-lol! You can also see a piece of paper that is my inspiration for the background colors. I like to start pieces simultaneously and work on them together up to a point. These are now at that point, and I will decide which one I want to finish today. Another quick note, I am extremely excited that I will be able to attend ZNE’s Convenzione this may! I am going to teach a Regalo Per Me, make and take class. More information will be following shortly.